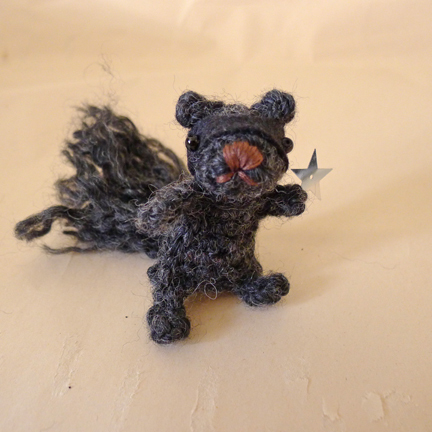 And unlike most squirrel plush, Katsu is grey. 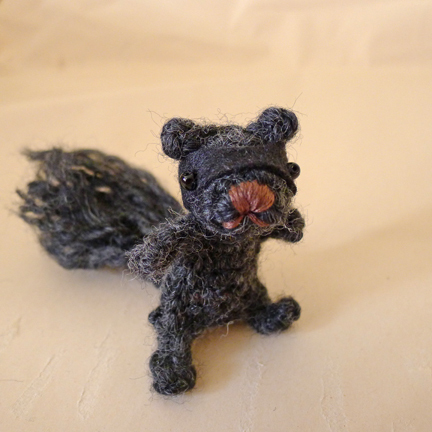 Because most squirrels in Toronto are actually grey, charcoal, or black, (and on extremely rare occasion, white!) but not brown. 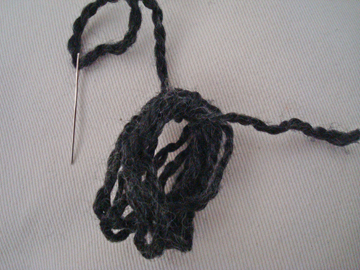 A note on yarn and hook: I used Shetland Chunky because that’s what I have. Other chunky or heavy worsted weight yarn would do. 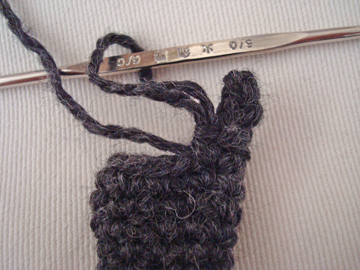 Or one could probably substitute with a worsted weight yarn, but may have to use a 3.5mm hook instead. 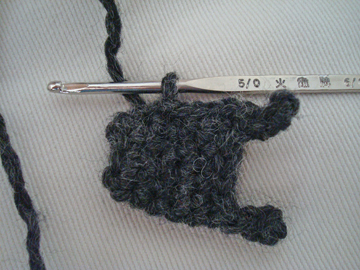 I like to have a fairly tight gauge when crocheting plush, so it would keep its shape. Step 1: ch 3, 5 sc in 3rd ch from hook, sl st in top of beginning ch. Step 3: sc in each sc until piece measures 1″ from beginning. Step 4: 2 sc tog until there are 5 sc left, sl st in next sc, leaving a 6″ tail, fasten off. 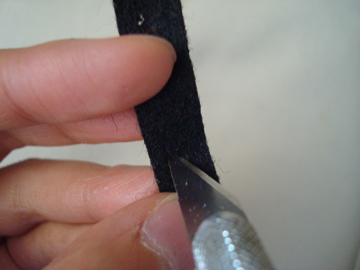 Stuff head, weave tail in the 5 stitches around the opening and pull taunt, tie off. 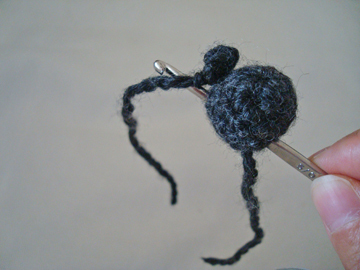 Leaving a 4″ tail, ch 3, sl st in 3rd ch from hook, leaving a 4″ tail, fasten off. Position ears on head. 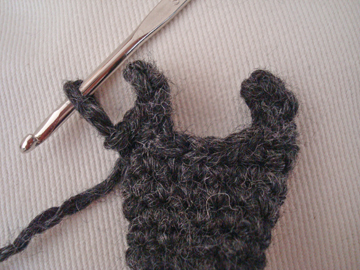 Using crochet hook, pull tails, one at a time, through the head and out through adjacent stitches at the bottom of the head. 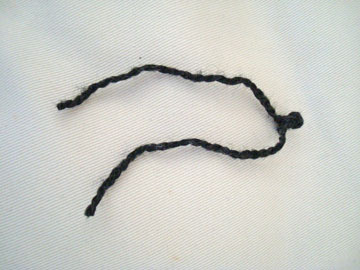 Tie tails at the bottom of the head. Repeat for the other ear. 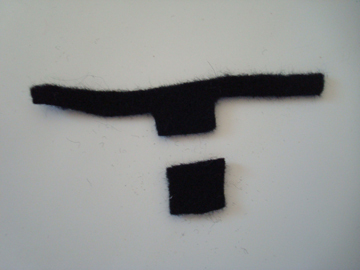 Cut a small strip of black felt and pin it to head with straight pins to determine position of eyes. 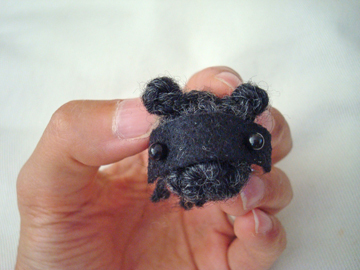 I happen to have straight pins with black bead pinheads, which make perfect stand‐ins for eyes. Take mask off head. 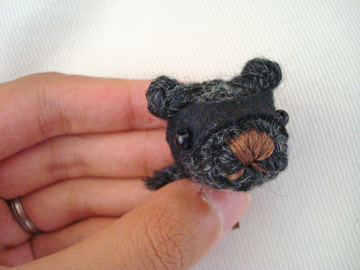 Note where the pin holes mark the eyes, and cut the holes bigger with an Exacto knife. Trim the mask between the eyes and bottom left and right to create a more mask‐like shape. Step 1: ch 10, sl st in 1st ch to form a ring. 1 sc in each ch around. Step 3: 2 sc in next sc, 1 sc in each of the next 4 sc, 2 sc in next sc, then 1 sc in each sc until piece measures 1 1/4″. You’ll get a tube shape. Flatten the “tube” for the following steps. Step 4 (leg): ch 4, sc in 2nd st from hook, 1 sc in each of next 2 ch, sc in the stitch beside where the ch 4 of leg began. 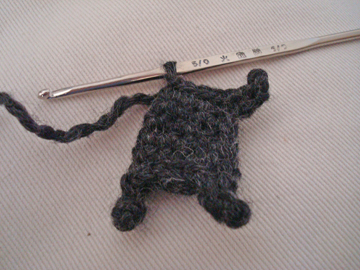 Step 5: Crocheting through both front and back piece of body, sl st in each of the next 4 sc. 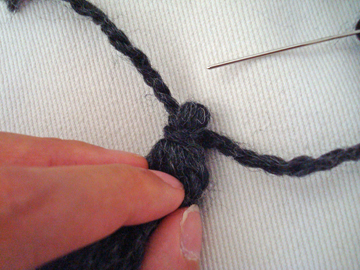 Step 6 (other leg): ch 4, sc in 2nd ch from hook, 1 sc in each of the next 2 ch, sl st in next closest stitch of body. Step 7: sl st up the side of body until 3rd last round before neck. (Begin arm) ch 4, sc in 2nd ch from hook, 1 sc in each of next 2 ch, sl st in next sc of body. Step 8: sl st across neck opening in front layer ONLY. (Begin other arm) ch 4, sc in 2nd ch from hook, 1 sc in each of next 2 ch, sl st in next sc of body. Sl st down the side of body until beginning of leg. Fasten off. Stuff body through neck opening. Sew head to body. 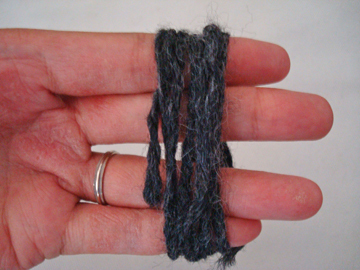 Wind yarn around 4 fingers 7 times. 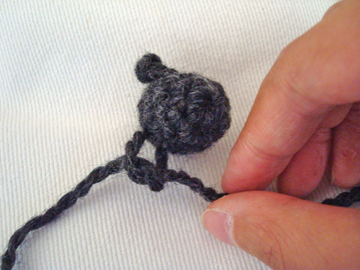 Tie the two tails together. 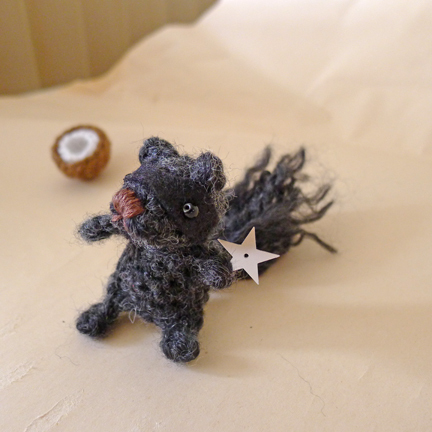 With the needle still threaded, pin the tail to the squirrel :D and secure with a few stitches. 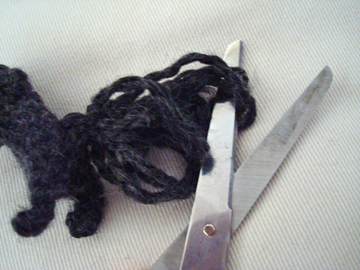 Cut all the yarn loops open. 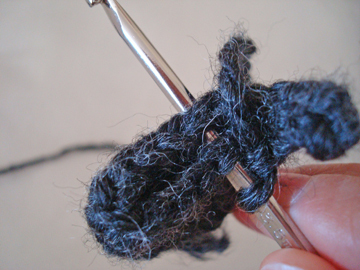 Fray the individual strands of yarn. Then gently roll the tail between palms. 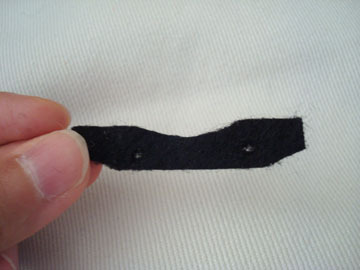 Then I sewed 3 sides of the rectangle to the belted part, leaving the top open. 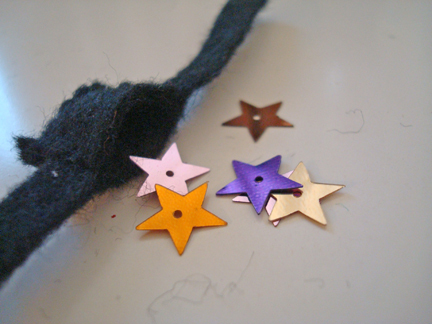 Then I just put it on Katsu and pinned the back together with a tiny safety pin. Adorable! You are so creative; it is delightful to see your work! OMG! This is just the cutest thing I’ve ever seen!! I must have one :) Thanks for sharing him with us! Wooo hoo! this is just awesome! I really love your patterns‐ they’re so original and cute. 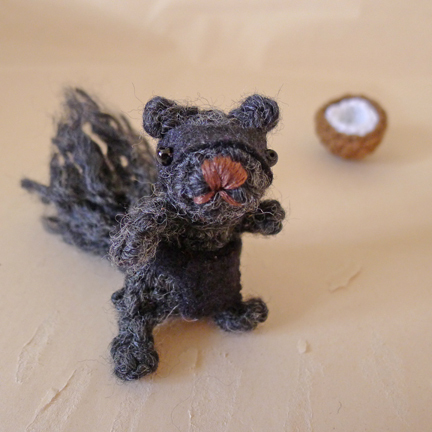 I’m creating a magic yarn ball with squirrel stitches markers and little acorns. This will definitely be in the center. Thank you so much! this sounds very cool! 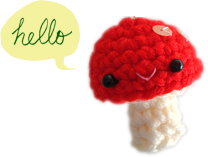 especially love the idea of little acorns :D thank you for visiting, Chari! Holy crapstick. I just found your blog, and I think I might be in love with you. Or at least your patterns. But possibly you as well.